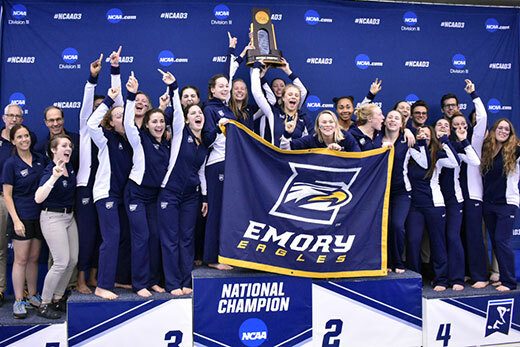 The Emory University women's swimming and diving team captured its 10th consecutive and 12th overall NCAA Division III Swimming and Diving National Championship Saturday night at the Greensboro Aquatic Center in Greensboro, North Carolina. The win marks Emory’s second NCAA Division III National Championship of this academic year, after Emory’s volleyball team won the NCAA national title in November. In the closest women’s swimming and diving championship meet in NCAA Division III history, the title race came down to the final two events of the evening. After Kenyon College went ahead following the 200 backstroke, the Eagles countered in the 200 breaststroke, regaining the lead with strong finishes in both the championship and consolation finals including a fourth-place effort by senior Ashley Daniels before sealing the deal with a national runner-up performance in the 400 freestyle relay by seniors Fiona Muir, Meg Taylor, sophomore Lucy Daro and first-year student Zoe Walker. Emory, led by Head Coach Jon Howell, posted 488 team points across the four-day meet with Kenyon finishing in second place at 479 points. The nine-point margin of victory is the narrowest margin of victory in the history of the NCAA Division III women's national meet, dating back to 1982. The Eagles concluded the championship meet with five event national titles, 19 All-America honors and 16 All-America Honorable Mention certificates. On the final day of competition, Muir closed out her impeccable career by adding another individual title to her ledger, taking gold in the 100 freestyle with a time of 49.37. The win marked Muir's third consecutive title in the event and the fifth overall for her at the 2019 Championships. The Eagles added a pair of national runner-up performances as well on Saturday with the aforementioned 400 free relay turning in a time of 3:21.18 and senior Julia Durmer earning silver in the 1,650 freestyle at 16:44.55. To go along with Daniels' fourth-place finish in the 200 breast (2:14.10), Taylor had a fourth place effort of her own in the 100 freestyle, touching with a time of 50.53. Daro and first-yaer student Gaige Elms were crowned All-Americans as well on day four with Daro placing seventh in the 100 free (51.28) and Elms finishing eighth in the 200 backstroke (2:03.91). The Emory men's swimming and diving team saved their best performances for last, winning national championships in three of the final six events at the 2019 NCAA Division III Championships. With the three additional event titles on the final day of competition, the Eagles made a final push to finish as the national team runners-up for the second straight season. With their 447.5 total team points, Emory was able to edge out third-place Kenyon by just half of a point. It is the fourth consecutive and 17th time overall the Eagles have finished within the top three at the national meet. First-year student Jason Hamilton rounded out the Emory champions on evening with his first-ever individual title, winning the 200 breaststroke at 1:57.34. In addition, the Eagles were national runners-up in the final event of the meet, the 400 freestyle relay, as Kolleck, senior Matt Rogers, junior Sage Ono and first-year student Colin LaFave touched at 2:57.90. Ono and first-year students Lucas Bumgarner and Zach Lorson rounded out the All-America performers for the Eagles on the fourth and final day of competition. Bumgarner finished sixth in the 3-meter dive with a score 523.20 while both Lorson and Ono had eighth place efforts with Lorson in the 1,650 freestyle (15:14.84) and Ono in the 100 freestyle (44.91). In the 200 backstroke, the Eagles saw three All-America Honorable Mentions with first-year student Pat Pema placing 10th at 1:47.45, Rogers in 11th at 1:48.21 and first-year student Lawrence Redmond in 15th at 1:48.89.